“Team Jafri” relaxes at home in South Barrington. Pictured in front are Ashar Hasan (on left) and Ambreen Jafri. In back, from left are Fizza, Hamza, and Batool Jafri . 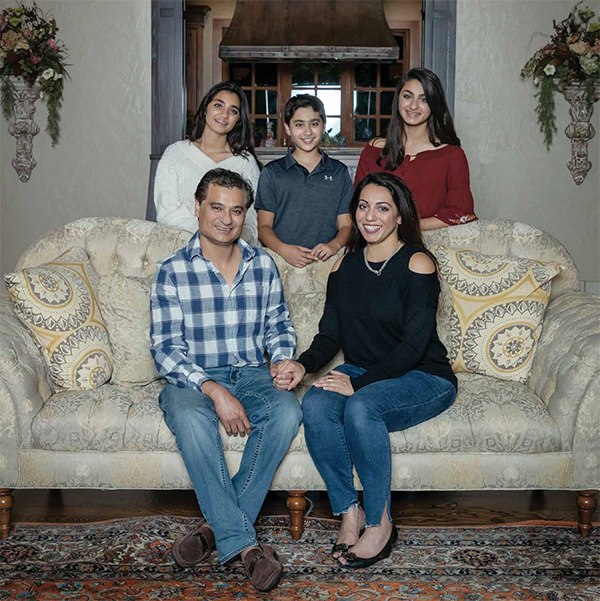 Every Saturday morning, South Barrington residents Ashar Hasan and Ambreen Jafri drive their three children to squash lessons at Lifetime Fitness in Vernon Hills. Lifetime’s is the closest squash court in the area and for good reason. Squash, a game that requires the mental agility of chess coupled with the physical prowess of an Olympic athlete, is popular on the East and West Coasts. But it’s little known in the Midwest. Ashar is certain that will soon change, because squash is one of the fastest-growing sports in America, according to U.S. Squash. In fact, participation in squash between 2010 and 2015 increased by 66 percent. In all, the sport boasts more than 20 million players in upwards of 185 countries, with top ranked athletes coming from England, Egypt, France, and Malaysia. The Jafris have witnessed college recruiters search for talent at U.S. Squash Association tournaments and corporate sponsors wait in the wings to entrust their brands with players who are capturing international attention. Their own kids—Batool, 15; Fizza, 13; and Hamza, 10—are well on their way to having the spotlight shined on them. Currently, Hamza ranks 12th in the country among squash players under the age of 11 and Batool, 62nd in the under-age-17 category. Atop squash’s hierarchy are the player levels Bronze, Silver, and Gold. Batool and Hamza compete at the Gold level, known as Junior Championship, and Fizza, Silver. She took two years off from squash for horseback riding before returning to the sport. Hamza is close to moving up the ranks, which would make him attractive to corporate sponsors. “His dream is to be sponsored by an airline,” Ambreen says, noting he would love to see the world and compete in China, Dubai, Egypt, and Italy. If all goes as planned, with or without sponsors, the family will soon travel internationally for competitions. “Hamza is expecting to play the Canadian and British Opens next year,” Ashar says. Squash players ( from left) Fizza, Batool, and Hamza Jafri competeat the national level. The Jafri’s children train seven days a week for about two hours a day with two private coaches. They work with Franz Schwerer, a retired professional squash player, at Lifetime Fitness. “He is a phenomenal coach with extensive experience identifying and nurturing talent,” Ashar says. And Mir Zaman Gul, a retired professional Squash player who ranked sixth in the world, at home. “He only takes on two or three students a year and builds them into professional players,” Ashar says of Gul, noting he moved here from the East Coast to train his kids. Training includes work-outs to build stamina and strength, and practice games with professional players to improve their skills. “It’s like their very own Game of Thrones, except a little bit nicer and less cutthroat, a little bit less,” Ambreen says of the kids competing against each other at home. “Our kids interest in squash multiplied after meeting with Jahangir Khan, all-time legendary world champion, considered to the be the greatest in squash history,” Ashar says, noting that Khan, who is from Pakistan, made the “Guinness Book of World Records” for the longest-winning streak by any athlete in top-level sports. Coach Schwerer often travels to competitions with the kids, studying their moves and advising them on strategy. The kids like attending professional squash matches and sitting near the coaches, listening to them strategize with players and learning by watching the pros compete. Ambreen and Ashar grew up playing squash for fun in Pakistan, where they were born. Ambreen, a dentist, came to America at age 22; Ashar, an entrepreneur, emigrated as a student at age 17. With degrees in pharmaceutical sciences and business, Ashar has launched and sold multiple pharmaceutical ventures to national companies. The Jafris appreciate the health and fitness improving aspects of the sport. Their children’s introduction to squash was serendipitous. The family moved to South Barrington 14 years ago, and then to a home fitted with an indoor sports court seven years ago, perfect for playing squash as a family. Realizing their kids had talent, they hired private coaches and built a professional squash court in their home. While all three Jafri children plan to play squash in college, they already have conventional careers in mind. Batool wants to be a doctor; Fizza, a lawyer; and Hamza, a bioengineer. In their free time, the children enjoy driving their golf cart to the local sand volleyball courts, skiing in Colorado or Lake Tahoe, kayaking on the community lake, and taking in the seasonal festivities—concerts, ice skating, and bungee jumping—at The Arboretum of South Barrington. 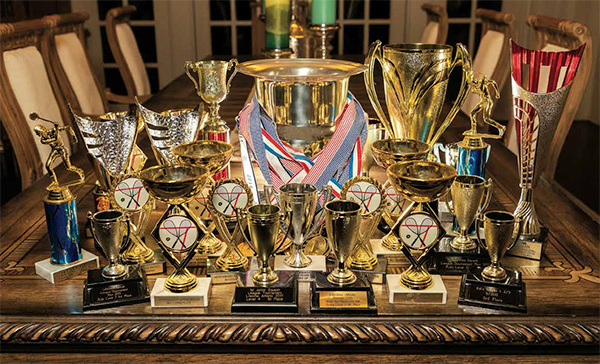 These squash awards are proudly displayed at home. Melanie Kalmar is a freelance writer specializing in business and human-interest features. When she’s not writing, she enjoys spending time with her family.